3G & 4G Mobile Phones. Covers all 3G and 4G bands worldwide. Lay the Passive Pad on your desktop and place up to 3 phones on top to couple the antenna signal to your phone. Note: Coupling efficiency may vary between phone models, connected band and placement position. Improves your 3G or 4G mobile phones reception and wireless broadband speed when used with a high-gain external Yagi antenna system. Tether your Mobile Phone as a Local Wireless Hotspot. Use your mobile phones Bluetooth to connect to Mobile-Link and Link2Mobile Handsets. • Current signal at the repeated area must be 0-1 bars. 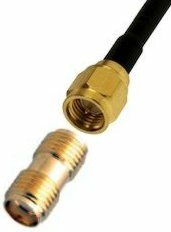 • Cable runs: >5m require LMR240 and >10m require LMR400 coax. • Generally, a high gain Yagi antenna of 16dBi depending on available signal..
• A high gain antenna of at least 13dBi depending on available signal. Other connection options are available with optional adapters. Pictured left is the SMA female adapter. The FME male option has an FME male to SMA female adapter included, as shown at left. dropouts. We are getting speeds of 23Mbps up to 28Mbps now compared to 10 to 14Mbps on our Bigpond Ultimate 3G Wifi (using speedtest.com)...."